Hot off the press here's a recording of the webinar from last night. We'll be adding a couple of photos and links from the webinar when we go live with issue 64 at the weekend. 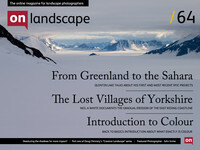 The webinar is the first in a set of three articles and talks about the reasons behind the techniques and what Doug means by 'creative' landscape photography (and I can assure you he isn't meaning other types of landscape photography are not creative!). The second part will be an on location guide to some of the techniques discussed in the field (literally!) and our final part will be another webinar in November looking at post processing these images. Also a big apology to the people who couldn't get into the webinar. Our provider (Gotowebinar) allows twice as many people to register for a seminar as can actually take part because they say they typically have a 50% drop out rate. It's testament to Doug that it seems we only had a 10% drop out rate but it's no consolation to people who could not get in. We've upped our subscription to a 500 subscriber model to ensure this doesn't happen again (at least no until we get a lot more popular anyway! ).